I'm not George R.R. Martin. I'm Ogre Jenni, and I work at the Jean Cocteau Cinema in Santa Fe. Here is the ancient song of my people. This weekend, we welcome another incredible magician to our stage! 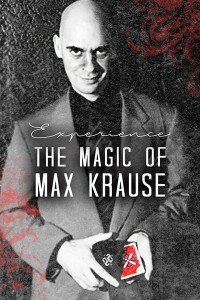 Max Krause, who also owns a really cool magic shop, will stun adults and children alike with his brilliant magical acts. He will perform some A Song of Ice and Fire themed tricks, befuddle us with expert-level prestidigitations, melt our brains (and our sense of free will) using his Mentalism techniques, and much more! Max has performed for several celebrities including (but definitely not limited to) The Minnesota Vikings, Frank Thomas (of the Chicago White Sox), The Cranberries, Motley Crue, Ted McGinley, James Belushi, and Metallica. METALLICA, PEOPLE! Make your jokes about Lars, if you must, but still! There is a good reason Max was invited to perform for Metallica. He is truly a world class magician. If you are near Santa Fe this weekend, bring your friends and family! They'll all have a great time.